This study aims to provide an overview of the implementation of character education in elementary school of Kreatif, Karangan district, Trenggalek. Approach that used in this research is qualitative approach and this research type is a case study. 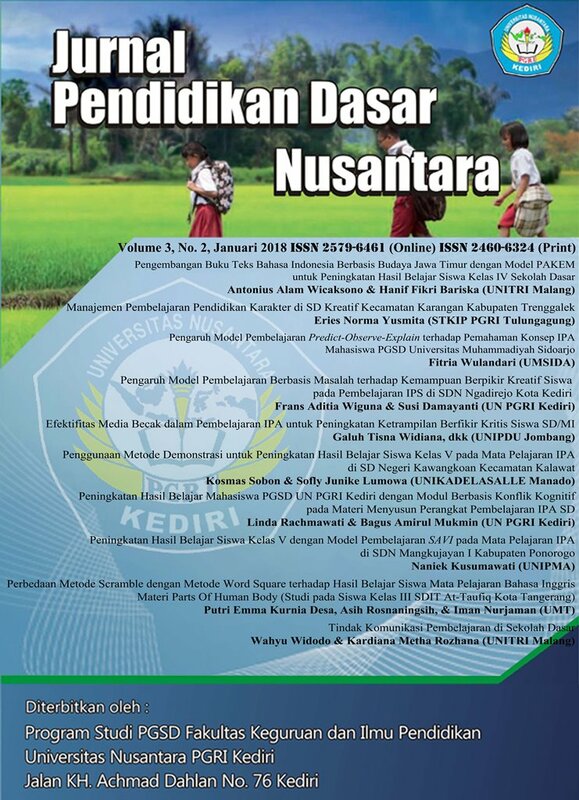 This research is focused on the case of planning, implementation, evaluation, and obstacles of character education implementation in elementary school of Kreatif. The character education that is planned and implemented by elementary school of Kreatif is 3, that is the education of the character of discipline, honesty, and religious. Character education applied in elementary school of Kreatif not only carried out in the learning process but also implemented outside the learning process. Educators do not just ask their students to train and instill character education in themselves. Educators also set an example of appropriate behavior with character education that has been planned and applied to elementary school of Kreatif. Keywords: character education, elementary school. Yuniarti, Lusi. 2011. Profil Pelaksanaan Pembelajaran di Kelas 1 Sekolah Dasar Negeri Percobaan Malang. Skripsi tidak diterbitkan. Malang: PPs UM. YUSMITA, Eries Norma. MANAJEMEN PEMBELAJARAN PENDIDIKAN KARAKTER DI SD KREATIF KECAMATAN KARANGAN KABUPATEN TRENGGALEK. JURNAL PENDIDIKAN DASAR NUSANTARA, [S.l. ], v. 3, n. 2, p. 152-166, jan. 2018. ISSN 2579-6461. Available at: <http://ojs.unpkediri.ac.id/index.php/pgsd/article/view/11778>. Date accessed: 24 apr. 2019. doi: https://doi.org/10.29407/jpdn.v3i2.11778.